Authentic Bavarian entertainment – as stereotype – means traditional oompah-music from Munich. German brass music and the Schuhplattler dance ( shoe slapper dance) is a bavarian tradition and THE cultural dance of the alps region in Germany and Austria. The Bergvagabunden as German oompah band offers corporate Bavarian and Tyrolean event packages, e.g. in a Munich bier keller. Audience participation at any event is always guaranteed. Book these musicians for events like your own German bier festival and benefit from real um pah music. The guys performed at countless bier keller evenings and um pop nights in the UK, France, Netherlands, Belgium, Luxembourg etc. Have fun with Bavarian table dances and German toasts or Prosits the um pah style, benefit from the experience of professional musicians and entertainers. Snippets: bavarian bands UK, bavarian oompah bands, bavarian bands for hire, bavarian band in Instanbul – Turkey, Kasachstan, China, India, Russia… See also Bavaria Wikipedia. Are you organising a Bavarian themed event in Germany or elsewhere in Europe? As a european Bavarian-style band with instruments like trumpet, trombone, tuba, baritone, accordion we would like to do the Yodel and the Schunkel with your guests. Engage us for your live music event with real Hofbrauhaus feeling. 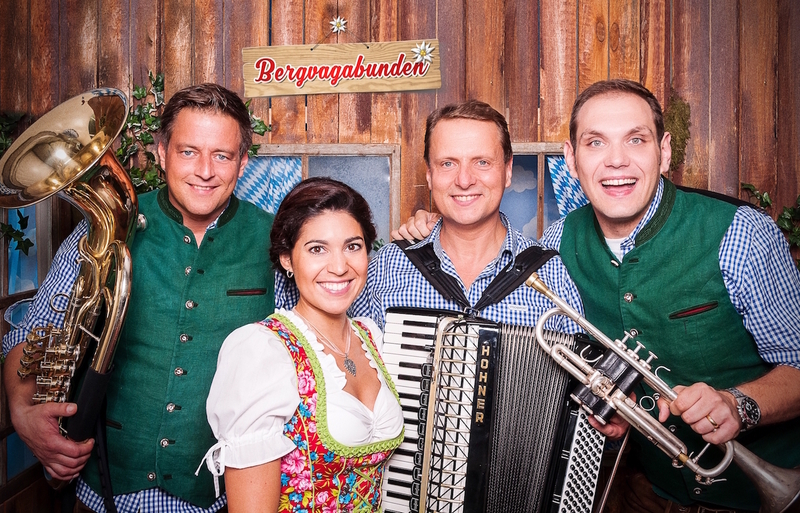 Private party, business parties, beer festivals, bavarian night, oktoberfest, weddings, corporate events, birthdays in a bavarian style – the Bergvagabunden as a Blaskapelle (brass band) deliver Germanic music and culture german speaking and english speaking. With authentic marches, polkas, waltzes, folk dances from destination bavaria / Germany it is a perfect live band for bavarian themed entertainment. Looking for bavarian style bands or german themed acts for events or festivals? Stop searching: folk entertainment, yodeling group, and austrian folk band with lederhosen costume, waiscoats and tyrolian hats is provided in Bavaria – Munich and worldwide, incl. world famous duck dance / chicken dance. Engage the Bergvagabunden with folk and alpine music walking around or on stage. The party band and function band plays bavarian music and folk music (or volksmusic / volksmusik) and apres ski hits in Austria / Tyrol, England – London, Ireland – Dublin, Switzerland – Zurich etc. Ain’t that wunderbar? Read more about Bavarian bands booking in Germany.